Numatic Charles CVC370 from Gillmans Commercial Appliances. 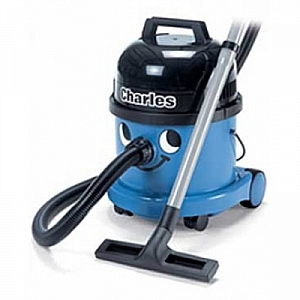 Wet suction or dry vac. with powerful 1200W two stage motor. Comes with safety float valve for wet use and big filters and disposable dust bags for dry use. Standard kit is A21A which has aluminium (non rusting) tubes and two floor nozzles - one for wet work and a combination nozzle for carpets and hard floors. This machine does not shampoo.